The king has returned. Jon Favreau is currently hard at work getting Disney's live-action version of The Lion King ready to go for summer 2019. Disney announced the full cast for the movie last month, which includes Donald Glover as Simba. 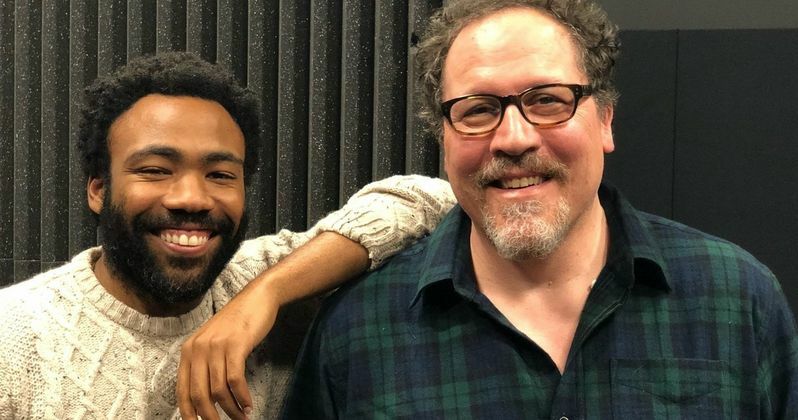 Now, Favreau has shared a behind-the-scenes photo from the set, showing that things are moving right along on The Lion King, as Donald Glover is currently in the studio getting to work as Simba. We know that The Lion King is going to use the same technology that Jon Favreau used for The Jungle Book to make the creatures come to life. Though they looked incredibly real, all of the animals in The Jungle Book were CGI and it looks like it'll be the same for this movie. However, the actors who voiced the characters used motion capture to provide a visual reference for the CGI characters. It's likely that Jon Favreau will have the actors do the same this time around. However, in this photo, it looks like Donald Glover is just recording some lines as Simba in a sound studio. Here's how Favreau captioned the photo. The animated version of The Lion King remains one of Disney's most beloved movies ever, so there are probably some who are concerned about the idea of a remake. However, during Disney's D23 Expo over the summer, some footage from the movie was shown that faithfully recreates the Pride Rock sequence from the beginning of the original. Though the footage hasn't made its way online, it reportedly looks incredible and remains very faithful to the animated version of The Lion King. Only this time around, everything looks real enough to touch. Not only does Disney have the technology to pull something like this off, but they've also assembled a very impressive voice cast for this live-action take on The Lion King. The cast includes Donald Glover as Simba, Beyoncé as Nala, Chiwetel Ejiofor as Scar, Alfre Woodard as Sarabi, John Oliver as Zazu, John Kani as Rafiki, Seth Rogen as Pumbaa, Billy Eichner as Timon, Eric Andre as Azizi, Florence Kasumba as Shenzi, Keegan-Michael Key as Kamari, JD McCrary as Young Simba and Shahadi Wright Joseph as Young Nala. Last, but most certainly not least, James Earl Jones returns as Mufasa, after having provided the voice of Simba's father in the original movie. While it seems like this movie is going to be almost entirely CGI animation, this will look and feel like a live-action remake. Disney has had a tremendous amount of success with such remakes in recent years, such as Alice in Wonderland, Cinderella and this year's Beauty and the Beast, which is the highest-grossing movie of 2017. Disney looks to continue that streak with The Lion King, which is set to arrive in theaters on July 19, 2019. Be sure to check out the new behind-the-scenes photo, courtesy of Jon Favreau, for yourself below.